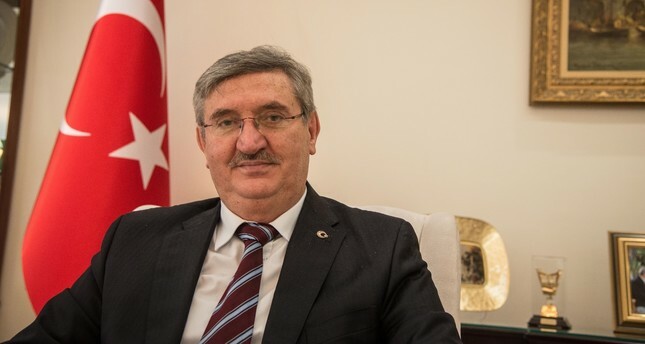 Turkey’s envoy to Qatar Fikret Özer said bilateral relations have developed quickly in recent years on the basis of mutual interests and have reached an exemplary level. Turkey helped Qatar following the blockade and sanctions on the country last June due to Ankara's fundamental values in the face of the growing threat to the stability and security in the region and the people there, Turkey's Ambassador to Qatar Fikret Özer said. Speaking to Daily Sabah in an exclusive interview in the Qatari capital city of Doha, the Turkish envoy stressed that the sanctions and blockade that rattled the tiny peninsula country last year were unjust and directly targeted the people of Qatar, which led to Ankara's swift help due to its main values. "Turkey was seriously concerned about the crisis that broke out between Gulf Countries a year ago and the negative effects of the crisis for the welfare and prosperity of the people of the region and above all the Qataris. In this framework Turkey has taken quick steps towards supplying materials that the people of Qatar urgently needed due to the economic sanctions that they faced," Özer said. Underlining that Turkey's backing of Qatar was a result of its main principals, the ambassador said: "The elements that were put forward as the reason for the sanctions against this country were far from convincing not only Turkey but international actors, above all Western countries." He added that Ankara therefore sided with Qatar by taking into consideration the damage that the Qatari people would receive. Recalling that the Turkish government has been calling on all states to cease the sanctions from the very beginning, Özer said that the feud "within the family" should be resolved in peace. "We have underscored in every meeting that we have had from the very beginning that the crisis that we consider as a family issue should be solved through dialogue and diplomacy." On June 5, Saudi Arabia, the United Arab Emirates (UAE), Egypt and Bahrain cut diplomatic and economic ties with Qatar over allegations that the emirate supported terrorists. The Saudi-led bloc recalled their ambassadors, ordered all Qataris to return home and banned Qatar from using their airspace, completely isolating Doha. The Turkish envoy said that Ankara's backing of Doha has deepened and bolstered bilateral ties. "The ties between Turkey and Qatar, two friendly and brotherly countries that have a deep-rooted history and cultural relations, developed quickly in recent years on the basis of mutual interests and reached an exemplary level," Özer said, adding that the post-blockade help further strengthened it. Touching on Turkey's military presence in the Qatari capital, the Turkish ambassador said that it serves the interests of both countries and it is for the benefit of the region. "The activities for the deployment of Turkish Armed Forces (TSK) in Qatar are mainly the result of an ongoing process since 2014. This process does not target any country, nor does our military presence in Qatar have any relation to the current crisis in the Gulf region," he said. Emphasizing that the Turkish army will remain in Qatar as part of the agreement between Ankara and Doha in 2014, Özer said: "As we face serious security threats both at the regional and global level nowadays, the military and security cooperation that we develop with Qatar will benefit not only the two countries but also our region and the world." Even though Ankara and Doha enjoy excellent political ties at every level, economic ties have not been as effective. Getting to the bottom of the issue, the Turkish envoy said that necessary steps are being taken and the economic ties have been much better since the blockade. "With the steps that have been taken, our exports to Qatar increased by 48 percent to $649 million as of the end of 2017 and our bilateral trade volume increased to more than $1.2 billion. While our country was the 15th largest supplier to Qatar in 2016, it has become the 10th supplier in 2017 and our share of Qatar's total imports has increased from 1.7 percent to 2.7 percent," he explained. Still, the Turkish envoy believes it is not enough. "Of course we do not find these figures sufficient, and we are striving for our economic relations to develop in parallel with the depth reached by our political cooperation. In this framework, we aim to sign the Trade and Economic Partnership Agreement that is of great importance for the removal of obstacles in the way of the trade." Turkey has indeed been very active in diplomacy in the region for some time. Ankara's initiatives at the time of the Qatar blockade were, for example, exemplary for the whole world. The Turkish envoy asserts that Ankara's warm relations are not limited to Doha. "Turkey has forged exceptional relations with, not only Qatar, but with other Gulf countries in recent years with the strong political will put forward. These relations that get their strength from a common past and cultural ties are based on mutual trust and understanding," he said. Noting that Ankara places great value on peace, stability and security in the Gulf region, Özer suggested that the aforementioned concepts are key to welfare in the whole Middle East. "We are fully prepared to work for the future of countries in the region and to develop the existing cooperation in a way that contributes to the peace, stability and prosperity of our countries and the region on the basis of a common vision."